Peter has specialised in PI litigation for over 20 years and, so far as possible, sought to maintain an equal balance between representing claimants and defendants. He is renowned for his expertise in evaluating the strengths and weaknesses of both sides’ cases and accurately evaluating the likely outcome of trial from an early stage. 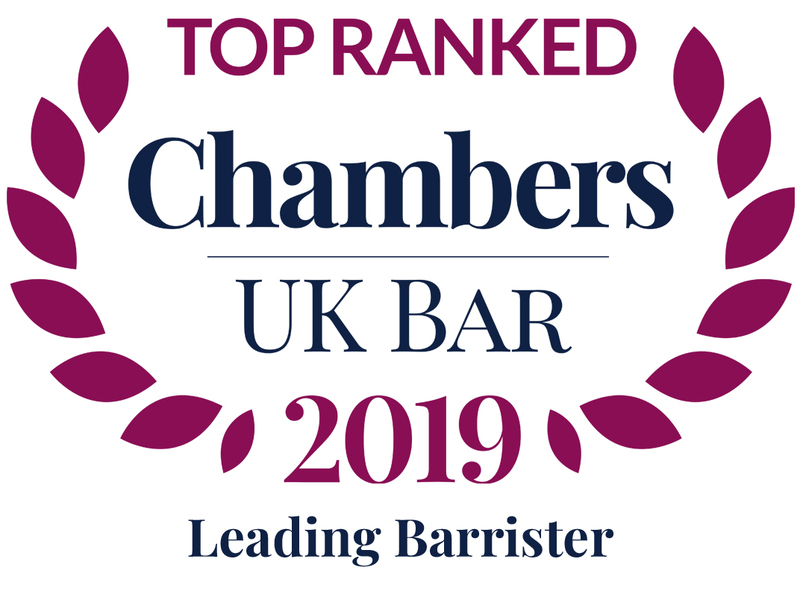 Peter undertakes virtually all types of personal injury work, with particular emphasis on high value claims, complex causation and apportionment for contributory negligence. Peter has considerable recent courtroom experience of accidents involving motorcycles, buses and LGVs. He also has a niche practice in accidents concerning air travel, recently appearing in the Inquest arising from the helicopter crash that killed Lord Ballyedmond and three others. Peter never loses sight of the fact that at the heart of these cases are real people whose lives have been shattered. “An outstanding catastrophic injury junior who represents both claimants and defendants, and regularly goes head to head with QCs”. “Highly experienced in a range of complex personal injury matters, including catastrophic and psychiatric injury claims”. “… especially recommended for … handling of liability”. “… acts for claimants and defendants, and singled out for praise by peers and solicitors”. “…greatest strength is his ability to adapt to the personalities around him and gain favourable results even against the most belligerent of opposition”. “…no signs of weakness in court”. “… blessed with an ability to cross-examine which is almost second to none. Gains credit for the fact that he is particularly good at sympathising with clients and dealing with people without a hint of condescension”. Initially instructed to represent D at a JSM in a liability admitted claim in which £125,000 interim payments had been made. Advised to withdraw from the JSM, apply to withdraw the admission and strike out the claim. Representing D in a fatal road traffic accident. The driver of an LGV was in stop-start traffic in a busy area and aware of pedestrians crossing from both sides in between vehicles. The Deceased left the footpath and walked in front of the LGV. D’s driver looked in his mirrors, but did not see the Deceased. C submitted that the driver should have made a final check in his Class VI mirror before moving forward and, had he done so, he would have seen C. D’s driver did not make that extra check but moved forward whereupon the deceased lost his life. Claim dismissed. Judgment for D.
Representing D, whose bus passed through an amber light at a traffic light controlled pedestrian crossing and struck C, causing a severe brain injury. Claim dismissed; Judgment for D.
C was trying to board a coach he believed had stopped to allow him on, when he was knocked over and the front wheel ran over his legs causing severe injuries. C’s representatives view of their prospects was reflected in a Part 36 offer of 80 / 20 in C’s favour. Claim dismissed with judgment for D.
Representing D in protracted litigation. The accident occurred in 2008. In 2009, D made an interim payment of £10,000 followed by a further £5,000. Proceedings were issued in 2011. D made attempts at Part 36 offers in December 2011, but by 2012/13, C was claiming £400,000 and D felt unable to make any further Part 36 offer for fear of becoming liable for C’s costs to that date. C was born with a congenital deformity of the right hand such that the index, ring and middle fingers of the right hand were absent. Throughout her life, C had understandably been left hand dominant. As a result of an accident on 31.05.09, C slipped and fell onto her left hand, sustaining a wrist fracture with some displacement, scapholunate ligament disruption, an aggravation of arthritis in the CMC joint of the thumb. C also alleged some CRPS and psychological sequelae. Rehill v Rider Holdings Ltd  EWCA Civ 42 CA (Civ Div); and  EWCA Civ 628 (Civ Div). Taking over the brief to represent D at trial. C was hit by a bus and, by the time it stopped, its front wheel had gone over him, causing serious crush injuries. D’s bus driver pleaded guilty to careless driving and D had admitted liability for an incident in which C had been struck and run over by their bus. A motorcyclist sustained a traumatic leg amputation as a result of a collision with an LGV. Representing D at trial and with J Watt-Pringle QC on appeal. At first instance, the Recorder apportioned liability 50 / 50. On appeal, it was held that the Recorder had erred in imposing an unacceptably high standard of care on a lorry driver. Primary liability was not established. We are delighted to announce that Peter Freeman has accepted an invitation to join Temple Garden Chambers. Peter is a talented and high profile senior junior specialising in personal injury litigation. I am registered with the Information Commissioner’s Office (ICO) as a Data Controller for the personal data that I hold and process as a barrister. My registered address is Temple Garden Chambers, 1 Harcourt Buildings, Temple, London EC4Y 9DA. In accordance with the General Data Protection Regulation (GDPR), I am committed to protecting the privacy of personal information. I will take all possible steps to protect the personal information that I see as a result of instructions in cases, and I will endeavour to ensure that rights are not infringed. This statement explains how I may collect and process information as a barrister. If you have any queries about information that may have been collected and held by me, you can contact me by email at pf@tgchambers.com. The information that I hold about you is provided to or gathered by your legal team in the course of your case. Your solicitor will tell you why we need the information and how we will use it. To provide training. Trainees (pupil barristers and “mini-pupils” on short placements in chambers) are made aware of the strict duties of confidentiality applicable to legal work. I will always do my utmost to ensure the confidentiality of your personal information and will share with the trainee only the minimum amount of information necessary to provide such training (and will, if I can, avoid sharing any personal information at all with the trainee). But please do tell me (by email or in writing by post) if you would prefer that your case not be used by me for training purposes and I will not use it in that way. My lawful basis for processing any third party’s information provided to me in relation to your case is that processing is necessary for compliance with a legal obligation to which I as controller am subject, namely the obligation to provide legal services under the contract with you. (A “third party” is another person – whether the other party in the dispute or someone else whose information is relevant, such as a witness to the event in question). My lawful basis for processing any special categories of personal data (yours or a third party’s sensitive personal data, eg. medical records) is that the processing is necessary for the establishment, exercise or defence of legal claims. There are overriding legitimate business interests, including but not limited to my obligations to keep records in case of future complaint or claim against me, fraud prevention and protecting customers’ safety and security. http://ico.org.uk/for_the_public/personal_information and this is the organisation that you can complain to if you are unhappy with how I dealt with you. Remember your user preferences and settings. Your data will never be sold, nor will it be passed to a third party, unless for legal or regulatory reasons.